the event and end after the event. participate in the volunteer activities below. 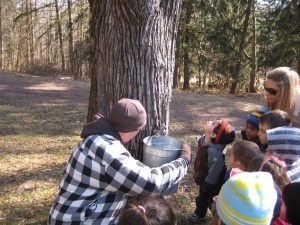 Maple Sugaring Events begin in February. Help Collect Sap and enjoy some homemade Maple products. During the event, cook and serve pancakes and talk about maple products. Play a station character: the naturalist, the Native American, the frontiersman, or the evaporator tender. Script provided! February weekdays, help collect sap. Please contact Patrick Eckard at (908) 782-1158 or peckard@co.hunterdon.nj.us. Volunteers are needed to run crafts and games and take photographs. Please contact Laura Bush at (908) 782-1158 or lkroon@co.hunterdon.nj.us. Saturday, May 18, 2019 / 10:00 AM – 1:00 PM / Melick’s Bridge, Ages: all (volunteers under 14 must be accompanied by an adult) Cost: free! If you are looking for a way to help improve the environment around your watershed, then look no further! Our local NJ Watershed Ambassador will be hosting a Tree Planting event on Saturday May 18 from 10:00 AM to 1:00 PM at Melick’s Bridge Section of the South Branch Reservation (245 Hamden Rd., Annandale 08801). The event will consist of planting and putting protective covers on about 160 tree saplings right next to the Raritan River. Tools and gloves will be provided to all volunteers, but you may bring your own if you like. Light refreshments will also be served. This tree planting aims to stabilize the banks of the Raritan River, create new habitat for the local wildlife, and connect the community to their watershed. Please contact Daniel Correa at (908) 234-1852 x 323 or americorps@raritanheadwaters.org for more information and to register. Help us install a trail to connect two County parks. In celebration of the County’s Annual Trails Day Event, the Hunterdon County Division of Parks and Recreation will install a new trail from Crystal Springs to Point Mountain. The trail corridor has been made possible with easements established with Cross Roads Camp & Retreat Center. There will be plenty of work for all as we will form multiple work groups to focus on different sections of the trail. While the trail will use field edges and an old logging road, about ¾ mile needs to be established. The focus of the project will consist of cutting back brush and vegetation and defining the tread-base for the trail. To aid in project tasks, volunteers are asked to bring their own loppers and clippers. A registration form or volunteer form is required to sign up for the event to help us track participants and aid in planning the event. (For interested groups, each member or family must fill out a separate volunteer form.) Thanks to generous donations, breakfast and lunch will be available. Meet at the Teetertown stone house, 30 Pleasant Grove Road, Port Murray (the middle entrance). Please contact Tom Sheppard at (908) 782-1158 or tsheppard@co.hunterdon.nj.us. Help County Rangers park cars. Assist manager with concert tasks. Volunteers needed to run the Hunterdon County Division of Parks and Recreation information booth. (Wednesday through Sunday, three- or four- hour shifts available from 4:30 PM to 10:00 PM weekdays, 10:00 AM - 10:00 PM Saturday, or 10:00 AM - 5:00 PM Sunday. Please contact Liz Fulmer at (908) 782-1158 or lfulmer@co.hunterdon.nj.us. Saturday, September 28, 8:30 AM to 12:30 PM, TBD. 12 through adult (children must be accompanied by an adult). Cost: free! Please contact Debra Reed at (908) 782-1158 or dreed@co.hunterdon.nj.us. We need cool vehicle owners to bring their cool vehicles to share with the general public. Many volunteers are needed for a variety of positions throughout the day—parking, greeters, hospitality, vehicle babysitting, lunch break help, attendance clicker, setup/cleanup. Assist Park Naturalist with a group of up to ten children ages 3 through 9 as they do nature activities. Tuesdays 9:30 – 11:00, 1:00 – 2:30 PM, and 4:00 – 5:30 PM. Must be willing to commit to at least one of the time slots for an entire 8-week session. Winter session runs January 8 – February 26. Spring session is April 2 – May 21. Fall dates TBA. Assist Park Naturalists with a one-day nature camp for kindergartners through fifth graders. We will cover camp favorites such as shelter building, stream study, and a campfire. Volunteers can assist with one or both days. Assist basket instructor with large scout & school groups, prepare material, set-up, and teach basketry. Most programs run on weekdays, but some are on Saturdays. Assist canoe leader staff with canoe trips and clinics. Includes loading equipment, assisting participants, loading and unloading canoes. Some experience necessary. Share your knowledge, abilities, and/or experiences. Would you like to offer a program to your community? Call us at (908) 782-1158! 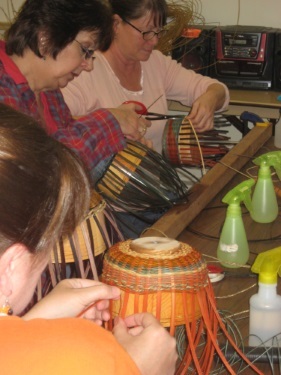 For recreation/craft programs, email Liz Fulmer at lfulmer@co.hunterdon.nj.us. For nature/interpretive programs, email Laura Bush at lkroon@co.hunterdon.nj.us. Several times during the year, we have need of advertising new public programs through various websites. This can be done at the Parks office or in your home at your own pace. Contact Laura Bush at (908) 782-1158 or lkroon@co.hunterdon.nj.us. 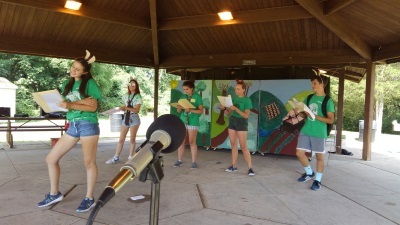 Help make our summer camps exciting, safe, and fun… volunteer! This is a volunteer opportunity for teens entering 9th through 12th grades. Counselors-in-Training (CITs) will be selected for Performance Camps, Craft Camps, Art Camps, Basketry Camp, and LEGO Camp. 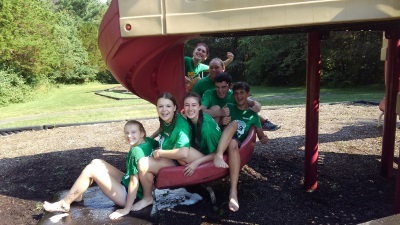 Teens will assist counselors in many aspects of running camp. This is a great opportunity for on-the-job experience and a boost for your résumé. There will be a mandatory CIT training on Wednesday, June 19, 6:00 PM to 9:30 PM at the Arboretum. A volunteer opportunity for teens entering 10th, 11th, and 12th grades. Counselors-in-Training (CITs) will be selected for each of our two Summer Nature Camp sites (Echo Hill and Teetertown). Have fun outdoors while building your resume. CITs are required to attend an evening training session on Thursday, May 30 from 6:00 PM to 9:00 PM at Echo Hill. Must be able to commit to a minimum of two weeks during the camp season. Thank you to Avery, Chris, and Seth Gould from Boy Scout Troop 65 in Ringoes for painting several signs in our parks. The Hunterdon County Division of Parks and Recreation accepts the kindness of scout groups looking to offer community service, including those scouts working on Eagle or Gold projects. Our Adopt-a-Trail Program keeps our parks clean, safe, and ready for use by everyone. In order to accomplish this, we are seeking citizen volunteers and/or volunteer organizations (scout troops, civic organizations, etc.) to adopt a specific trail and to agree to periodically walk and inspect the trail. Volunteers will walk the trail at least once a month for ten months of the year, conduct litter clean-up, remove debris, do minor shrub and vine pruning, and report any need for additional work that may have to be performed by the County (such as fallen tree removal). 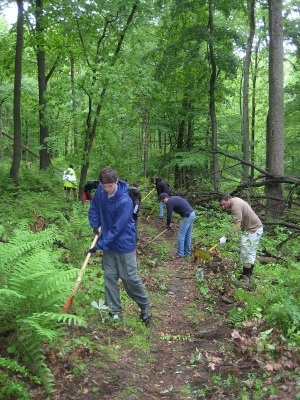 So if you love nature and enjoy working outside, please join the Adopt-a-Trail program. To sign up, contact Patrick Eckard at (908) 782-1158 or peckard@co.hunterdon.nj.us. Care for our Arboretum gardens. Please contact Jason Strauss at (908) 782-1158. We are seeking volunteers to monitor bluebird and wood duck boxes in the County Parks. Includes checking for nesting success at the end of the nesting season, as well as cleaning out old nests and repairing or reinstalling houses that fall down. Call us at (908) 782-1158! For wood ducks, email Debra Reed at dreed@co.hunterdon.nj.us. For bluebirds, email Laura Bush at lkroon@co.hunterdon.nj.us. We are seeking volunteers to walk one of our parks twice a month to record what species they see each time, whether it is plants, fungi, mammals, birds, insects, etc. Volunteers do not need to be an expert on all nature topics; however, they should have a basic knowledge of at least one of the categories of plants or animals. We are building a database of all species living in our parks from volunteer and employee observations. We are seeking volunteers to help paint signs at various County parks. Paint and brushes will be supplied. Contact Liz Fulmer at (908) 782-1158 or lfulmer@co.hunterdon.nj.us.